For scaffold hire in Bristol and Bath, look no further than CVSS. We have the experience, equipment and manpower to deliver the exact specification of scaffolding that you need every time. It doesn’t matter how big or how small the property is, we can supply a scaffolding solution to suit you. If you need scaffold hire in Bristol, please fill in the contact form below with your requirements and we will get back to you as soon as possible. For scaffolders in Bristol of the highest quality, look no further than Chew Valley Scaffolding Services for all your scaffolding and access requirements. Our company operates 24 hours a day, 7 days a week so we are always on hand to provide a service to stick to demanding deadlines. We understand the need to be available around the clock to erect or dismantle to suit particular circumstances, and our scaffold hire in Bristol will always be tailored to your exact needs. 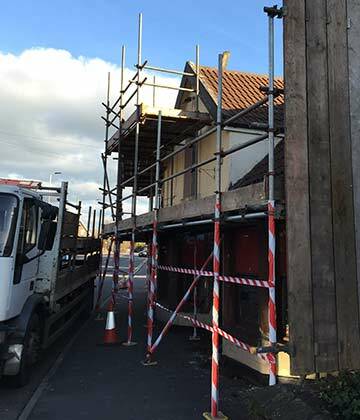 We are based in Keynsham, Bristol and so we are your ideal choice for scaffolding services in Bristol and the surrounding area.